El Cobert de Vilaformiu has got capacity for 8 people, 4 bedrooms (one double bed). The house has two bathrooms, fully equipped kitchen, dining and living room with fireplace and television and a separate garden with barbecue. It also has central heating! 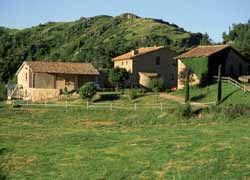 It's located 5 minutes from Berga, next to a small equestrian center, surrounded by fields and woods. At the starting point of the Route of the Cathars, stands out for its privileged environment. In the organized multiple activities, from horseback riding or paragliding for the more adventurous, excursions and visits to museums theme for lovers of tranquility.